It would therefore make sense that adding an incentive to something far more important, like working safely on the job, would not only work but would also be laudable. Despite that logic, over the years OSHA has taken a negative stance towards safety incentive programs that inarguably has had the result of preventing many such programs from being deployed. As a result, there are countless accidents and injuries that could have been prevented if workers had been better engaged and properly motivated to work safer. This was not done maliciously of course, OSHA shares the same interests and safety related values as the companies they regulate. They clearly want all workers to be safe on the job, or as their mission statement reads “…to assure safe and healthful working conditions for working men and women…” Their previous position on safety incentive programs comes as result of hearing stories of abuses created from poorly designed programs and their reaction/overreaction to doing something about it. To be clear the companies that created such programs weren’t trying to be malicious or subversive in creating them, they too were just looking for a safer workforce. That said, those poorly designed programs did earn the distrust they received. They often featured overly large awards (pick up trucks and trips to Hawaii) that were given in a sweepstakes type drawing to one winner. With a design like that it was no wonder that accident/injury hiding would take place. Take away that poor program structure and replace it with one where each worker is rewarded individually, incrementally, and with moderately valued awards, tied to their own personal safety accomplishments, and you eliminate any fear of accident/injury hiding. Add in an “Above & Beyond” component that rewards for proactive safe behavior (suggestions, near-miss reporting, mentoring, etc.) and you will have created a very engaging and successful program. Want to go one step further? 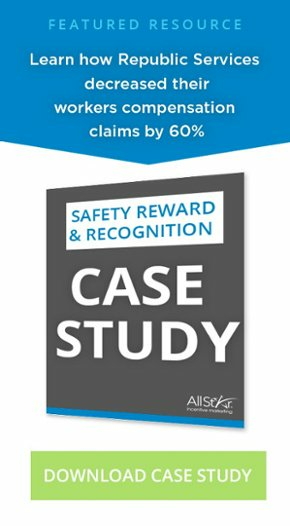 Include a program element that allows a worker to earn points even in a month where they had a preventable accident or injury as long as they reported that incident in a timely manner and took all prescribed follow up actions to mitigate further issues. In this piece OSHA makes clear that properly built safety incentive programs are legitimate attempts to promote a safer workplace. I believe the following quote from this clarification is the clearest statement by OSHA yet showing that they understand that these programs are deployed with the best intentions and great results. "The Department believes that many employers who implement safety incentive programs ..... do so to promote workplace safety and health. In addition, evidence that the employer consistently enforces legitimate work rules (whether or not an injury or illness is reported) would demonstrate that the employer is serious about creating a culture of safety.."